First of all, I'm happy to report I had NO pre-race funk! If you've followed my blog for a while, you know I normally get moody, edgy, and stressed on race week. Enough so that my wife added "good mood" to my packing list for NOLA :-). I tried hard not to have that happen for this race and it worked! It really made for a much more fun race experience. To have that happen, I pretty much just didn't think about the race. 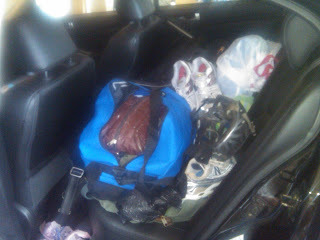 So I packed the morning I left for the race site and only forgot my running visor and Halo sweat shield. Not bad. The other thing I did different for this race was trying to meet some people. I'm kind of an introvert (being an engineer and all) and have gone to races alone and not talked to anyone. Not a fun way to race, trust me. So for this race, there were several people from BT racing and I made it a point to hook up with them. I met Ann, Mary, Mike, Joe and Joe's wife Michelle. It is so much more fun racing with friends than alone. I need to make a point of meeting more triathletes. I arrived on site the day before the race. 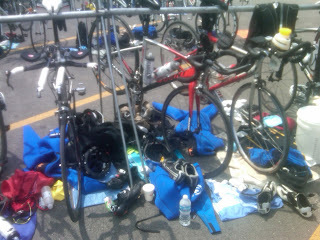 Picked up my race number and swim cap then swam the sprint course, biked the run course and did a brief run. The water was chilly (66F), but perfect with a wet suit on. After the brief workout, I met up with Ann, Mary, Joe and Michelle for dinner. Again, it was nice to eat with other athletes. I stayed at my BIL and SIL's camper near the bike turn around. It was very quiet and peaceful. I slept great after getting an electrical issue taken care of with help from my SIL. Race morning I woke up ahead of my alarms and ate a yogurt and banana. I bought peanut butter and bread at Walmart the night before but I also bought peanut butter stuffed pretzels and ate a bunch of them before bed, so I wasn't very hungry. Transition was open from 6 until 8 and I got there about 6:30 and was one of the first to arrive. I was set up by 7 and just hung out. I wasn't nervous or stressed at all even though I knew my longest OWS swim yet wasn't going to be easy. For the swim my plan was to start wide and stay wide. I pretty much did that but would drift back toward the crowd then back wide. I was really off course on the back stretch. I was a good 50 yards wide. It felt like it was taking forever and I stopped and got my bearings at least 10 times. I expected to see 45 minutes on my watch when I exited the water so I was surprised when I saw 37. The wet suit was so buoyant that it felt like my legs were too high and kind of bothered my lower back. I just need more practice OWS. In T1 I took 2 salt capsules, socks, shoes, glasses, helmet and I was off. I was happy with my transition, I wonder how fast it was. The bike was mostly flat with a couple steep hills. On the way out I was going 26-27 mph so I knew the way back would be brutal. 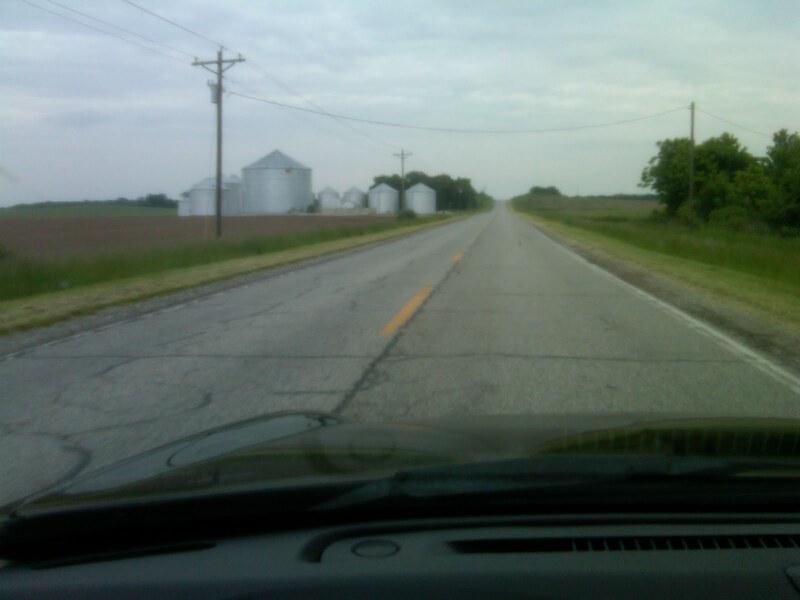 It was, a 10+ mph head wind meant 15-16 mph. I ate a GU about 10 minutes into the ride and another about 15 minutes from the end. I really had to choke down the second one. I need to practice eating while going nearly all out. I drank one 20 oz bottle of water on the ride. In T2 I took 2 more salt capsules. I need to put them in baggies so I can take them on the course instead on in T2. Then off with the helmet, switch shoes, grab race number and I was off. Pretty efficient again. 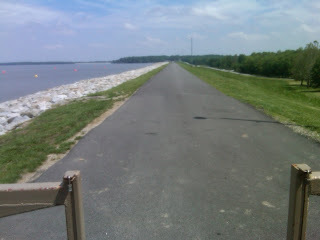 The run was out and back across 2 dams with a nice hill about a mile in and again a mile from the finish. It was hot but not as hot as last year. I could have gone a little harder but after my bike I knew I couldn't reach my goal and the kind of pain I would have had to inflict on myself wasn't worth coming up short. I felt pretty good and was encouraging many other triathletes and received much encouragement myself. What a cool sport. 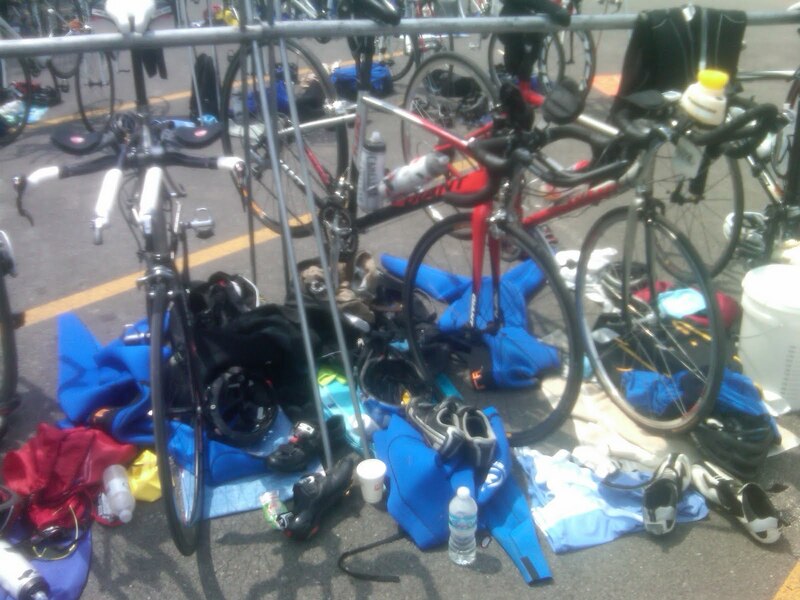 After the race, I got to clean up this mess in transition. And this mess when I got home. Not quite as neatly organized as when I blogged my gear checklist. That put me 3rd of 11 in my age group, 83rd of 159 overall, and 66th of 115 men. Not too shabby for a 45 year old non athlete. It does point out what I need to work on though. Yep, all three sports :-). Not bad at all - congrats! Your goals were aggressive and you were right there. 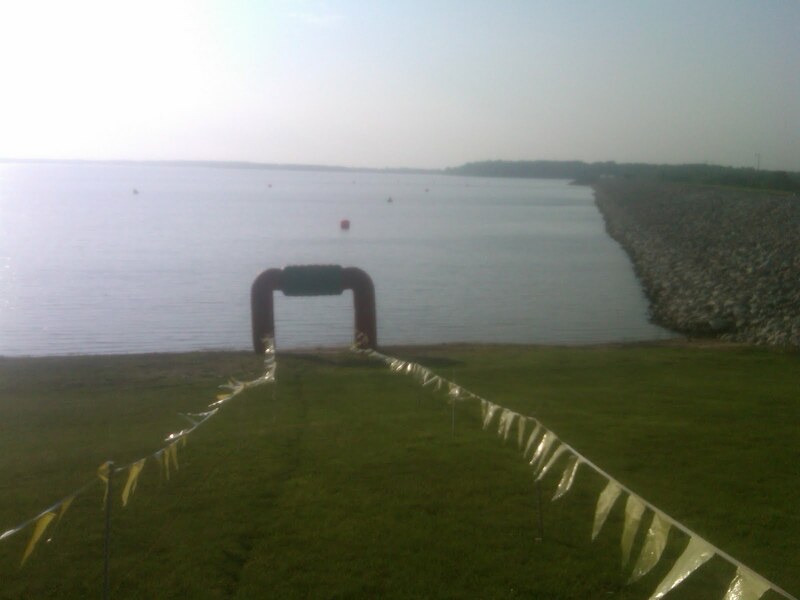 The course sounds like a fast one given the right weather conditions. I'm so much happier now that I usually know someone at a race. And I love cheering for other people in a race...it definitely helps me stay stronger. Congratulations on a great race!! Glad you were able to hook up with some fellow athletes - it DOES make it that much more fun, doesn't it? !